Do you have a missing tooth or missing teeth? Are you embarrassed to smile or laugh because the gap where a tooth should be will show? Do you have a hard time chewing because you have a missing tooth? Are the teeth on one side of your mouth getting worn down because you chew on that side to compensate for a missing tooth on the other side? If so, a tooth bridge or dental bridge might make all that difficulty disappear! A dental bridge or tooth bridge can literally bridge the gap and make your mouth full again. You can laugh, smile, eat and chew naturally. It corrects the issues that may have kept you from smiling or even eating properly. 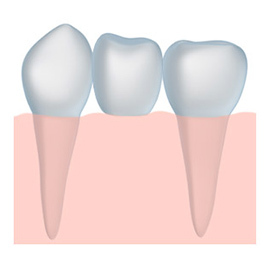 Basically, a tooth bridge or dental bridge is a false tooth, made from several different safe, strong materials, and it is connected between the teeth on either side. Those teeth, whether they are your real teeth or dental implants, have crowns placed on them and then the dental bridge is secured between the crowns. The bridge is just like a regular, natural tooth. In fact, you may forget that you ever had a missing tooth! Dental bridges can take an unsightly smile and make it complete and beautiful again. Dental bridges can help you chew and eat again, on both sides of your mouth! Dental bridges can restore your face to the shape it should be with a full set of teeth. Dental bridges can keep all of your teeth in their proper placement. At New Braunfels Dental Arts, Dr. Braun and his friendly, well-trained team care for you, your loved ones. We want all of your loved ones to have healthy, fabulous smiles. We are committed to making you feel and look fantastic. Call today and we can answer any questions you may have about a tooth bridge or dental bridges.